Bath Quays was a site for re-development, close to the River Avon and Wessex Archaeology undertook an evaluation and excavation prior to this re-development. A photo of 1892 shows it was a very industrial area. Apart from the springs, there is not much Prehistory in Bath. The Avon had migrated south, but it is not known when this occurred. The Roman temple complex is well known, with its hot springs, together with a scatter of villas in the area. The temple complex became the Medieval town centre. The 13th Century fosse dyke drains water from the hot springs into a ditch. In 1610 Speed’s map shows the fosse dyke. In 1694 Gilmour’s map shows Bath Quays undeveloped. The 1757 maps shows Robin’s Prospect. Avon Street comes down to the river front and further east is the Quay. It was Ralph Allen and others who got together to build the Quay. Harcourt’s 1895 map shows the area was very built up with poverty and prostitution. 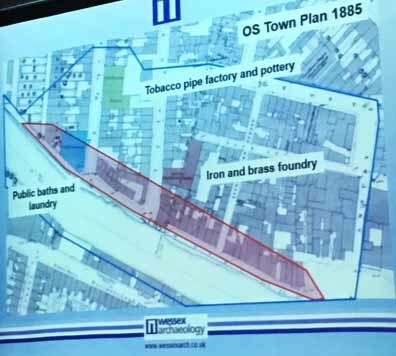 By 1885 the OS Town Map shows tobacco pipe factories, iron and brass workings and that the area was very industrialised. Wessex Archaeology began with evaluation trenches that were 1.5m down. On the river bank they found upstanding walls 1m high. Their excavation was a large area: 350m long, 2m wide and 3m deep. 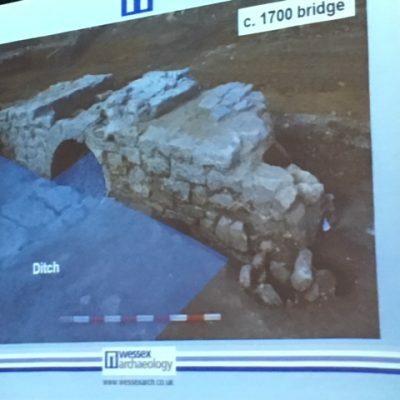 They found a Medieval ditch a 1580 wall, together with pottery both Medieval and Post Mediaeval. A complete 1700 bridge was well preserved. 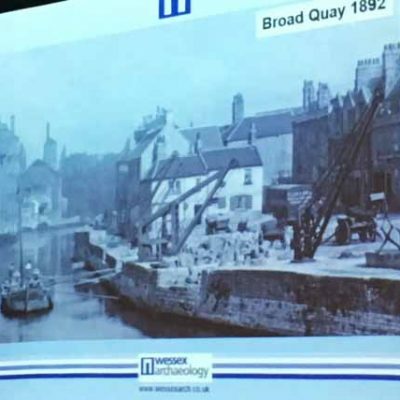 There were quayside structures dating to 1730s and a dock 2.5m wide and 10m deep. There was a cellar on the waterfront that flooded. At 3 New Quay there were lime pits and an earlier fellmongers wall. A fell monger is someone involved in the processing of skins for parchment. Evidence of parchment making came from the lime pits in which the skins were soaked and then stretched on racks. Behind this industry were slaughter houses, 18th Century buildings and Avon Street and domestic housing was sandwiched between the industrial buildings. Little Corn Street and New Quay (1765-6) were sound structures and were not intended to be slums. At Hucklebridge’s Court there were blind-back tenements. They were cramped, with a shared privy and wash house. They were street-front houses. By the 18-19th Centuries there was commerce along New Quay, which included industrial and lodging houses. At 4 New Quay there was a beer house converted into a pub in 1794, which was then used as a vagrant house. 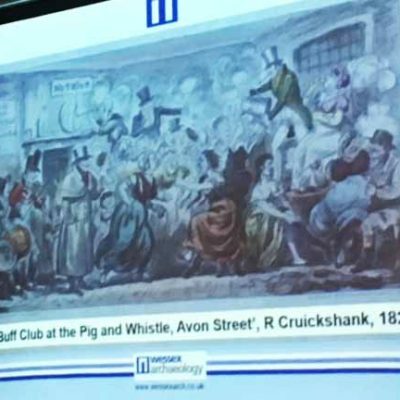 R. Cruickshank’s 1825 illustration shows the Buff Club at the Pig & Whistle, Avon Street. By the mid 19th C. there were brothels at 5-6 New Quay, with 30 people living there. Sanitation was not good; there were shared wells, but the drains ran close to the wells and effluent ran into the river. By the 1800s cholera had arrived (1832 was the first cholera noted in Liverpool) and attempts were made to combat it. Kitty Wilkinson set up the first public wash-house in Liverpool. In Bath there was a wash-house from 1845 and Lord Ashley and Charles Broderick set this up. At Milk Street there were baths and laundries. Excavation found the bases of a steam boiler, where water was pumped up from the river. There were cubicles and laundry wash stations. There was an absence of cess pits and therefore, it all went straight into the river. The finds from the excavation show dumping from the city as a whole. There are 18-19C. ointment pots and chemist’s bottles; 18C. glass phials; 19C. bone tooth brushes; 18C. porcelain tea bowl and bone spool. There is an Irish connection with clay pipes and beer bottles. A Madame Rosalie bottle head was unusual. There were also fish gaming pieces. In Summary, it was not possible to date the Fosse Ditch. In the 17-18th Centuries it was a rural site. By the 1860s the population had dropped and lots of buildings had been knocked down. By the 1920s the council were embarrassed by the state of the area and more buildings were knocked down. It suffered a 1942 air raid and then a car park, which tarmacked over the area and now it is to be re-developed. 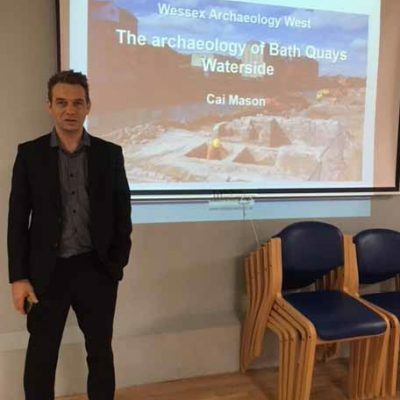 Cai Mason, Wessex Archaeology West. 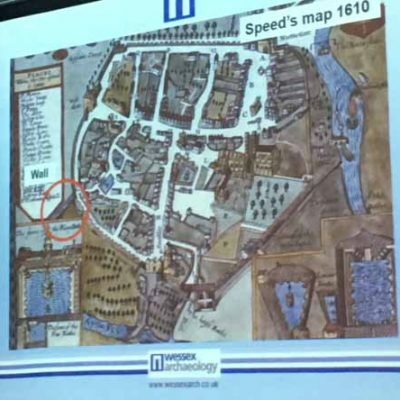 Speed’s map of 1610. Cruickshank’s 1825 illustration. O.S. Town Plan 1885. The excavated bridge. 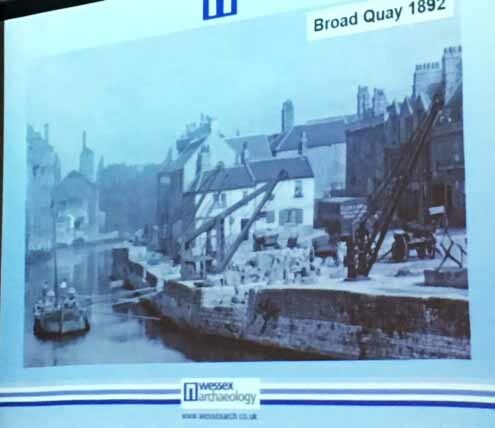 Broad Quay 1892.